개선된 원격 프로토콜은 원격 서버 상의 파일들의 효율적이고 신뢰성있는 업데이트를 가능하게 한다. Improved remote protocol enables efficient and reliable update of the file on the remote server. 원격 프로토콜로의 집결-복사(gather-copy) 확장은 클라이언트로 하여금 서버 상의 기존 소스 파일로부터 데이타 일부를 집결시키고, 이들 데이타 일부를 서버의 새 수신지 파일 내의 적절한 오프셋들에 복사하도록 지시할 수 있다. Gathered in a remote protocol - Copy (gather-copy) expansion may cause the client to instruct and gather the data part from an existing source file on the server to copy these data, some of the new appropriate number of offset in the destination file on the server . 그러므로, 집결-복사 확장은 클라이언트로 하여금 파일 업데이트 동안에 클라이언트가 새 데이타를 기록할 수 있는 수신지 파일 내의 비어 있는 위치(location)들을 클라이언트가 남겨두도록 할 수 있다. So, gather-copy extension may cause the client to keep the client leaves the position (location) that the client is in the empty can to record new data destination files during updates. 집결-복사 확장은 또한 클라이언트로 하여금 소스 파일로부터 수신지 파일로 그들을 복사하지 않음으로써 소스 파일의 부분들을 효과적으로 삭제하도록 할 수 있다. Gather-copy extension can also cause the client to effectively delete portions of the source file by not copying them to the destination file from the source file. 그러므로, 파일 업데이트는 클라이언트로부터 서버로 전체 파일을 전송할 필요없이 행해질 수 있다. Therefore, the file update can be done without the need to send the entire file from the client to the server. 도 1은 원격 프로토콜 통해 원격 파일 업데이트를 구현하기에 적절한 예시적인 동작 환경을 도시하는 도면. Figure 1 is a chart showing the exemplary operating environment suitable for implementing remote file updates through a remote protocol. 도 2는 원격 프로토콜을 통해 원격 파일 업데이트를 구현하도록 구성된 클라이언트 디바이스 및 서버 디바이스의 실시예를 도시하는 도면. Figure 2 is a view showing an embodiment of a client device and a server device configured to implement remote file updates through a remote protocol. 도 3은 원격 서버 상의 소스 파일과 수신지 파일의 예 및 클라이언트에서 소스 파일의 클라이언트 복사본의 예를 도시하는 도면. Figure 3 is a diagram showing an example of the client copy of the source file from a source file on the remote server and the client may for example, and the destination file. 도 4는 원격 서버 상의 소스 파일과 수신지 파일의 예 및 클라이언트에 소스 파일의 클라이언트 복사본의 예를 도시하는 도면. Figure 4 is a diagram showing an example of the client copy of the source file to the client, and examples of the source file and destination file on a remote server. 도 5 내지 도 8은 원격 프로토콜을 통해 원격 파일 업데이트를 구현하는 예시적인 방법을 도시하는 흐름도. 5 to 8 is a flow chart showing an exemplary method for implementing remote file updates through a remote protocol. 도 9는 도 1 내지 도 8을 참조하여 논의된 바와 같은 클라이언트 컴퓨터 디바이스 및 서버 컴퓨터 디바이스를 구현하기에 적절한 예시적인 컴퓨팅 환경을 도시하는 도면. 9 is a view showing an exemplary computing environment suitable for implementing a client computer device and server computer device such as those discussed with reference to Figures 1 to 8. FIG. 본 출원은 2004년 7월 19일에 출원된, 미국특허 가출원번호 제60/589,145호에 우선권을 주장한다. This application claims priority to an application on July 19, 2004, US Provisional Patent Application No. 60 / 589,145 calls. 본 발명은 전체적으로 클라이언트-서버 프로토콜들에 관한 것이고, 보다 구체적으로는, 신뢰성있고 효율적인 원격 파일 업데이트를 가능하게 하는 프로토콜들로의 확장에 관한 것이다. The invention as a whole a client-server protocol relates to, and more specifically, relates to a reliable and extensions to the protocol to enable efficient remote file updates. 모바일 기술들의 급증으로, 점점 더 많은 기업들이 클라이언트 머신으로부터 서버로 계속 이동되고 있는 키 사용자 데이타로의 네트워크 액세스를 제공하고 있다. The proliferation of mobile technology, more and more companies continue to move to the server from the client machine to provide network access to key data in the user. 모바일 사용자들이 네트워크로부터 단절되었을 때조차도 모바일 사용자들이 그러한 네트워크 데이타를 이용할 수 있게 하는 것에 큰 이점들이 있다. There are big benefits to mobile users that makes even mobile users can use such a network data when disconnected from the network. 예를 들어, 네트워크로부터 단절된 동안 네트워크 데이타에 계속 액세스하는 것은 그 사용자들이 여행할 때, 집에서 일할 때, 또는 네트워크가 다운되었을 때, 사용자들이 그 파일을 작업할 수 있도록 한다. For example, you still have access to network data while disconnected from the network, so that when you are traveling, at home, at work, or when the network is down, users can work with the files. 네트워크로부터 단절된 동안 네트워크 데이타에 액세스하는 것의 또 다른 이점은 클라이언트와 서버 머신들 간의 네트워크를 통해 전송되고 있는 데이타 양을 감소시킨다는 것이다. Another advantage of access to network data while disconnected from the network is that it reduces the amount of data being transmitted over the network between client and server machines. 클라이언트측 캐싱(caching)은 모바일 사용자들이 네트워크로부터 단절되어 있는 동안 네트워크 데이타로의 액세스를 유지하는 주요 방식이다. Client-side caching (caching) is the main way of maintaining access to network data while disconnected from the network are mobile users. 클라이언트측 캐싱은, 예를 들어, 서버의 네트워크를 통해, 액세스되는 파일의 로컬 복사본을 모바일 사용자가 저장하도록 한다. Client-side caching is, for example, over the network of the server, and the local copy of the file to be accessed to a mobile user is stored. 네트워크로부터 단절된 후에도, 여전히 사용자가 그 파일의 로컬 복사본을 편집할 수 있다. Even disconnected from the network, users can still edit the local copy of the file. 네트워크에 재접속시에, 서버의 파일의 복사본이 업데이트될 수 있다. When reconnected to the network, the server copy of the file can be updated. 클라이언트측 캐싱을 용이하게 하고, 네트워크를 통한 원격 컴퓨터의 서버 프로그램들을 통해 컴퓨터 상의 클라이언트 어플리케이션이 파일들을 판독하고, 파일들을 생성하고, 파일들을 업데이트하고, 다른 파일 시스템 작업들을 수행하도록 할 수 있는 클라이언트-서버 프로토콜들의 다양한 구현들이 존재한다. Clients that can facilitate client-side caching, through a server program on the remote computer over a network client application on a computer that reads the files, creating files, and update files, and to perform other file system tasks - there are various implementations of server protocol. SMB(Server Message Block) 프로토콜은 TCP/IP 프로토콜 또는 IPE(Internetwork Packet Exchange)와 NetBEUI와 같은 다른 네트워크 프로토콜들의 상부에서 인터넷을 통해 사용될 수 있는 프로토콜의 예이다. (Server Message Block) SMB protocol is an example of a protocol that can be used via the Internet at the top of other network protocols such as TCP / IP protocol or the IPE (Internetwork Packet Exchange) and NetBEUI. 그러한 프로토콜들로의 통상의 동작 모드는 클라이언트가 요청을 하고, 서버가 응답을 되돌려 전송하는 것이다. The normal operation mode of such a protocol is that the client requests, the server sends back a response. 그러므로, 그 러한 프로토콜들은 클라이언트로 하여금 원격 서버 상의 파일 시스템에 대해 임의의 "파일 시스템 제어" 동작들을 호출할 수 있도록 한다. Therefore, any such protocols feature that enables clients can call any of the "File System Control" operations on the file system on the remote server. 현재의 클라이언트측 캐싱의 방법들이 갖는 단점들 중 하나는 클라이언트와 서버 간에 데이타를 전송하는 동안 직면할 수 있는 상당한 레이턴시 및 응답 시간이다. One of the disadvantages which are present in the client-side caching method is a significant latency and response times that can be encountered while transferring data between the client and the server. 예를 들어, 파일을 편집하기를 원하는 사용자는 우선 네트워크를 통해 클라이언트로 전체 파일을 다운로드한다. For example, a user wants to edit the file is first downloaded the entire file to the client over the network. 이어서, 사용자는 네트워크로부터 단절하여 그 파일을 편집할 수 있다. Then, the user can edit the file and disconnected from the network. 네트워크를 통해 서버와 재접속시에, 전체 편집된 파일은 동기화 프로세스에서 서버에 업로드된다. At the server and reconnect through the network, the entire edited file is uploaded to the server in the synchronization process. 최초 파일에 행해진 변경의 크기 또는 양에 무관하게, 전체 편집된 파일은 네트워크를 통해 서버에 푸쉬 백(push back)되어야 한다. Regardless of the size or amount of change made to the original file, the whole edited file must be (push back) pushed back to the server over the network. 그러므로, 10 메가바이트 파일에 행해진 가장 작은 변경(예를 들어, 1 킬로바이트 삽입 또는 삭제)조차도 전체 10 메가바이트 파일이 네트워크를 통해 2번 전송되어야 함을 요구한다. Thus, even 10 made the smallest change in MB files (e. G., Insert, or delete 1 kilobytes) requires that the entire 10 megabyte file be transferred over the network twice. 그러한 전송들에 대한 레이턴시 및 응답 시간들은 전화선이나 위성 링크와 같은 느린 링크들에 대해 특히 문제가 될 수 있다. Latency and response time for such transmission may be a particular problem for the slow link, such as telephone lines or satellite links. 현재의 클라이언트측 캐싱의 방법들이 갖는 다른 관련 단점은 클라이언트와 서버 간의 파일 업데이트 동안의 파일 손상의 위험이다. Other disadvantages associated with their current client-side caching method is a danger of file corruption during file updates between the client and the server. 파일 동기화 동안(예를 들어, 클라이언트로부터 서버로의 파일 업데이트), 업데이트하는 중에 발생하는 네트워크 오동작(glitch) 또는 네트워크 장애는 서버 상에서 업데이트되고 있는 파일을, 자동으로 복구할 수도 있고 복구하지 못할 수도 있는, 손상된 상태로 남길 수 있다. During file synchronization (for example, file updates to the server from the client), the updated network malfunction (glitch) or network failures that occurred while the capital to recover the files that are being updated on the server, automatically and which may not be recoverable It can leave a corrupted state. 파일 업데이트가 오래 걸릴수록, 업데이트 동안에 네트워크 문제가 직면될 가능성이 점점 더 높아지고, 파일이 손상될 수 있는 위험이 점점 더 높아진다. The update files take a long, increasingly more likely to be a network problem encountered during the update, the higher the risk that more files may be damaged. 따라서, 원격 파일들의 보다 효율적이고 신뢰성있는 업데이트를 제공하는 클라이언트측 캐싱을 개선하는 방법이 존재할 필요가 있다. Therefore, there is a need for a method to improve client-side caching that provides a more efficient and reliable updating of remote files reside. 본 발명에 따른 방법 및 시스템은 개선된 원격 프로토콜을 통해 원격 파일들의 효율적이고 신뢰성있는 업데이트를 가능하게 한다. The process according to the invention and the system allows the efficient and reliable updating of remote files through an improved remote protocol. 원격 프로토콜의 집결-복사 확장은 클라이언트로 하여금 서버 상의 기존의 소스 파일로부터 데이타 일부를 집결하고, 서버 상의 새 수신지 파일 내의 적절한 오프셋들에 이러한 데이타 부분들을 복사하도록 명령할 수 있게 한다. Gathered in the remote protocol - Copy extension allows a client to the command to copy these data to the appropriate part of the offset in gathering data from an existing part of the source file on the server, and the new destination file on the server. 그러므로, 집결-복사 확장은 클라이언트로 하여금 파일 업데이트 동안 새 데이타를 기록할 수 있는 수신지 파일 내의 비어 있는 위치(location)들을 남겨두도록 할 수 있다. So, gather-copy extension may cause the client to leave the position (location) in the empty can to record a new data file for updating a destination file. 집결-복사 확장은 또한 소스 파일로부터 수신지 파일로 소스 파일의 부분들을 복사하지 않음으로써 클라이언트가 효율적으로 그 부분들을 삭제하도록 할 수 있다. Gather-copy extension can also be a client by not copying of the source file to the destination file from the source file to remove those parts efficiently. 그러므로, 클라이언트로부터 서버로 전체 파일을 전송할 필요가 없이 파일을 업데이트할 수 있다. Therefore, you can update your files without the need to transfer the entire file from the client to the server. 동일 참조 부호들은 도면 전반에 걸쳐 유사한 구성요소 및 특징들을 참조하도록 사용된다. Like reference numerals are used to refer to like elements and features throughout the drawings. 다음 논의는 클라이언트와 서버 디바이스들 간의 파일들의 효과적이고 신뢰성있는 업데이트를 제공하는 시스템 및 방법에 관한 것이다. The following discussion relates to a system and method for providing efficient and reliable updates of files between a client and a server device. 일반적으로 원격 서 버에 다양한 파일 시스템 작업들(예를 들어, 파일들의 판독, 생성, 및 업데이트)의 클라이언트 제어를 용이하도록 구성된 원격 프로토콜은, 클라이언트로부터 서버로 전체 파일을 전송할 필요없이 서버 상의 파일들을 클라이언트가 업데이트하도록 할 수 있는 확장을 포함한다. In general, the various file system on a remote server operation (e.g., reading of the file, creating, and updating) remote protocol configured to facilitate client control, the files on the server without having to transfer the entire file from the client to the server in the It includes extensions that can force clients to update. 원격 프로토콜의 확장은 기존 소스 파일로부터 데이타 블럭들을 집결하고, 새 수신지 파일 내의 적절한 오프셋들에 데이타 블럭들을 복사하도록 명령하는 새 파일 시스템 제어(fsctl) 커맨드이다. Expansion of the remote protocol gather the data block from the existing source file, a new file system control (fsctl) command that instructs to copy a block of data to appropriate offsets within a new destination file. 이어서, 집결-복사 fsctl 커맨드는 클라이언트로 하여금 그것이 새 데이타를 기록할 수 있는 수신지 파일에 "홀들(holes)"을 남기도록(또는 만들도록) 하고, 수신지 파일에 소스 파일의 부분을 복사하지 않음으로써 그 소스 파일의 부분을 삭제하도록 한다. Then, gather-copy fsctl command allows the client to leave "holes (holes)" in the destination file, it can be capable of writing the new data (or to create), and you can not copy a portion of the source file to the destination file not so as to remove a portion of the source file. 기재된 시스템 및 방법의 이점들은 크기에서 전체 파일들에 비례하는 대역폭을 소모한다기 보다는, 크기에서 파일 변경들에 비례하는 대역폭을 소모하는 파일 업데이트를 포함한다. Advantages of the described system and method, rather than consuming bandwidth proportional in size to the entire file, and a file updates that consume bandwidth proportional in size to file changes. 이것은, 업데이트 동안 네트워크 장애가 파일 손상의 원인이 될 위험을 줄이면서, 파일 업데이트 동안 지연과 응답 시간들을 줄인다. This is reducing the risk of network failure will cause damage to files during the update reduces the delay and response time for updates. 도 1은 원격 프로토콜을 통해 원격 파일 업데이트를 구현하기에 적절한 예시적인 동작 환경(100)을 도시한다. Figure 1 illustrates an exemplary operating environment 100 suitable for implementing remote file updates through a remote protocol. 환경(100)은 적절한 운영 환경의 일 예일 뿐, 본 발명의 사용이나 기능의 범위에 대해 임의의 한계를 제안하도록 의도된 것은 아니다. Environment 100 is not intended to suggest any limitation as to the scope of use or functionality of one example only, the invention of a suitable operating environment. 기타 잘 공지된 컴퓨팅 시스템, 환경, 및/또는 적절할 수 있는 구성은 퍼스널 컴퓨터, 핸드헬드나 랩톱 디바이스, 멀티프로세서 시스템, 마이크로프로세서-기반 시스템, 프로그램가능한 소비자 전자제품, 네트워크 PC, 미니컴퓨터, 메인프레 임 컴퓨터, 상기 시스템들과 디바이스들 중의 임의의 것을 포함하는 분산 컴퓨팅 환경 등을 포함하지만, 이에 제한되는 것은 아니다. Other well-known computing systems, environments, and / or configurations that may be suitable are personal computers, handheld or laptop devices, multiprocessor systems, microprocessor-based systems, programmable consumer electronics, network PC, a minicomputer, mainframe being a computer, it is not distributed computing environments that include any of the said systems and devices, however, limited. 예의 동작 환경(100)은 네트워크(106)를 통해 서버 디바이스(104)(이후 전체적으로 "서버" 또는 "서버 디바이스"로서 언급됨)에 동작적으로 결합된 클라이언트 디바이스(102)(이하에 일반적으로 "클라이언트" 또는 "클라이언트 디바이스"로서 언급됨)를 포함한다. Example operating environment 100 is the server device 104. The client device 102 is operatively coupled to (hereinafter referred to as a whole as a "server" or "server device") via the network 106 (generally in the " and a client to be referred to as "or" client device "). 네트워크(106)는, 다양한 종래 네트워크 프로토콜들 중의 임의의 것(공공의 및/또는 사유의 프로토콜들을 포함함)을 채택하여, 다양한 종래 네트워크 토폴로지 및 유형(광, 유선, 및/또는 무선 네트워크들을 포함함) 중 임의의 것을 나타낼 수 있다. Network 106, various random one of the in the conventional network protocol adopted (including the public and / or private protocol), a variety of conventional network topologies and types (light, include wired and / or wireless network It may represent any of a box). 네트워크(106)는, 예를 들어, 홈 네트워크, 회사 네트워크, 또는 인터넷, 및 한 개 이상의 LAN(local area network) 및/또는 WAN(wide area network)의 적어도 일부를 포함할 수 있다. Network 106 may comprise, for example, at least a portion of the home network, a corporate network, or the Internet, and at least one LAN (local area network) and / or a WAN (wide area network). 클라이언트(102)와 서버(104)는 클라이언트(클라이언트 프로그램)가 서버(서버 프로그램)로부터 서비스를 요청하고 서버는 그 요구들에 응답하는 클라이언트/서버 모델을 사용하여 통신한다. Client 102 and server 104 requests a service from a client (client program) that the server (server program) and the server communicate using a client / server model, responsive to the request. 클라이언트/서버 모델은 일반적으로 원격 서버에서 클라이언트 어플리케이션들이 파일들을 액세스하고 조작(예를 들어, 파일들을 판독, 편집, 업데이트, 및 생성함)하도록 할 수 있는 통신 프로토콜에 기초한다. Client / server model is generally a client application to access a file on a remote server, based on a communication protocol that can be manipulated (e.g., read, edit, update, and create files). 그러한 원격 프로토콜들은 또한 통상적으로 프린터, 메일 슬롯, 및 명명된 파이프와 같은 다른 서버 자원으로의 액세스를 클라이언트들에 제공한다. Such remote protocols also provide access to other server resources such as a printer, typically, mail slots, and named pipes to the client. 그러한 프로토콜들의 예들은 SMB(Server Message Block) 프로토콜, NFS(Network File System) 프로코콜, WebNFS 프로토콜, CIFS(Common Internet File System) 프로토콜, 삼바 (Samba) 등을 포함할 수 있다. Examples of such protocols may include, such as SMB (Server Message Block) protocol, the NFS (Network File System) Pro kokol, (Common Internet File System) protocol WebNFS, CIFS protocol, Samba (Samba). 그러한 프로토콜들은 인트라넷이나 인터넷과 같은 다양한 네트워크들을 통해 사용될 수 있고, TCP/IP 프로토콜, IPE(Internetwork Packet Exchange) 프로토콜, 및 NetBEUI 프로토콜과 같은 다른 프로토콜의 상부에서, 또는 관련하여, 실행할 수 있다. Such protocols can be used with various networks such as an intranet or the Internet, on top of other protocols such as TCP / IP protocol, IPE (Internetwork Packet Exchange) protocol, and NetBEUI protocols, or associated, it can be executed. 일실시예에 대해 본 명세서의 아래에 논의된 바와 같이, 그런 프로토콜로의 확장은 원격 파일들의 효율적이고 신뢰성있는 업데이트를 가능케 한다. As discussed below in the present description for the exemplary embodiment, the expansion of such a protocol enables an efficient and reliable update of remote files with. 아래 일실시예가 SMB 프로토콜에 대해 프로토콜 확장을 기재하였지만, SMB 프로토콜은 기재된 확장으로부터 유리할 수 있는 적절한 프로토콜의 일례일 뿐임을 이해해야 한다. Although one embodiment the following example describes a protocol extension for the SMB protocol, it should be understood that the SMB protocol is only one example of a suitable protocol that may be advantageous from the described extension. 그러므로, 일실시예의 SMB 프로토콜의 사용은 확장이 적용될 수 있는 다른 적절한 프로토콜들에 대해 임의의 제한을 제시하도록 의도된 것이 아니다. Thus, one embodiment of a use of the SMB protocol is not intended to suggest any limitation as to other suitable protocols that expansion can be applied. 클라이언트(102)는 통상적으로, 이메일, 달력, 작업 관리, 문서 편집, 웹 브라우징 등과 같은, 통상의 컴퓨팅 기능들을 수행할 수 있다. Client 102 Typically, you can perform common computing functions, such as e-mail, calendar, task management, document editing and web browsing. 클라이언트(102)는, Microsoft(등록상표)로부터의 Windows(등록상표) 운영 체제들과 같은, 오픈 플랫폼(open platform) 운영 체제를 실행할 수 있다. Clients 102, an open platform such as the Windows (TM) operating system from Microsoft (registered trademark) can be executed (open platform) operating system. 클라이언트(102)는, 예를 들어, 데스크톱 PC, 노트북 또는 휴대용 컴퓨터, 워크스테이션, 메인프레임 컴퓨터, 인터넷 기기, 게임 콘솔, 핸드헬드 PC, 셀룰라 폰 또는 기타 무선 통신 디바이스, 개인 정보 단말기(PDA), 셋톱 박스, 그들의 조합 등을 포함하는 여러가지 종래의 컴퓨팅 디바이스들 중의 임의의 것으로서 구현될 수 있다. Client 102 is, for example, a desktop PC, a notebook or portable computer, a workstation, a mainframe computer, Internet appliance, a game console, a handheld PC, a cellular phone or other wireless communication device, a personal digital assistant (PDA), as any of a variety of conventional computing devices, including a set-top box, in a combination may be implemented. 클라이언트(102)를 구현하는 예시적인 컴퓨팅 환경은 도 9를 참조하여 아래에 보다 상세히 기재된다. An exemplary computing environment for implementing client 102 is described in more detail below with reference to FIG. 서버(104)는 일반적으로 데이타 파일들과 기타 자원들의 저장 및 관리를 제 공하는 파일 서버로서 구성된다. Server 104 is generally configured the storage and management of data files and other resources as a file server that provides. 서버(104)는 네트워크(106)를 통해 승인된 클라이언트들에게 그런 데이타와 자원들로의 액세스를 제공한다. The server 104 may provide access to such data and resources to authorized clients through a network 106. 서버(104)는, 데스크톱 PC, 워크스테이션, 메인프레임 컴퓨터, 인터넷 기기 등과 같은, 다양한 종래의 컴퓨팅 디바이스들 중의 임의의 것으로서 구현될 수 있다. Server 104, a desktop PC, a workstation, a mainframe computer, may be implemented as any of, a variety of conventional computing devices such as Internet appliances. 서버(104)를 구현하는 예시적인 컴퓨팅 환경은 도 9를 참조하여 이하에 보다 상세히 기재된다. An exemplary computing environment for implementing a server 104 is described in more detail below with reference to FIG. 도 2는 원격 프로토콜을 통해 원격 파일 업데이트를 구현하기 위해 구성된 클라이언트 디바이스(102)와 서버 디바이스(104)의 일실시예를 도시한다. Figure 2 illustrates one embodiment of a client device 102 and server device 104 configured to implement remote file updates through a remote protocol. 클라이언트(102)는 메모리(202)에 저장된 응용 프로그램들(204)을 실행시키기 위해 구성된 한 개 이상의 프로세서들(200)을 포함한다. The client 102 includes one or more processors 200 configured to execute the application 204 stored in the memory (202). 메모리(202)는 또한 클라이언트측 프로토콜(206)로서 도 2에서 참조되는 원격 프로토콜을 저장한다. Memory 202 also stores a remote protocol referred to in Figure 2 as client side protocol 206. The 현재 실시예에서, 클라이언트 프로토콜(206)은 SMB 프로토콜의 클라이언트측 컴포넌트로서 구현된다. In the present embodiment, client protocol 206 is implemented as a client-side component of the SMB protocol. 그러나, 상술된 바와 같이, 클라이언트 프로토콜(206)은 SMB 프로토콜에 제한되지 않고, 예를 들어, NFS 프로토콜, WebNFS 프로토콜, CIFS 프로토콜, 삼바 등을 포함하는 다양한 다른 적절한 프로토콜들로서 구현될 수 있다. However, as noted above, client protocol 206 is not limited to the SMB protocol, for example, it may be implemented as various other appropriate protocols including NFS protocol, WebNFS protocol, CIFS protocol, Samba, etc. 클라이언트 프로토콜(206)의 확장은 그것의 서버 상대편, 집결-복사 구현기, 에 대해 더 상세히 아래 논의되는 집결-복사 확장(시작자)(208)으로서 도 2에 도시된다. Extension of the client protocol 206 is that its far end server, gather-copy implementation group, in more detail gathered discussed below for - a copy extension (initiator) 208 is illustrated in FIG. 서버(204)는 메모리(212)에 저장된 서버 프로토콜(216)을 실행하기 위해 구성된 한 개 이상의 프로세서들(210)을 포함한다. The server 204 includes one or more processors (210) configured to execute a server protocol 216 stored in memory 212. 서버 프로토콜(214)은 SMB 프로토콜의 서버측 컴포넌트로서 구현된다. Server protocol 214 is implemented as a server-side component of the SMB protocol. 상술된 바와 같이, 클라이언트 프로토콜(206)의 집결-복사 시작자(208)로의 상대편은 서버 프로토콜(214)의 확장인 집결-복사 구현자(216)이다. As mentioned above, client protocol 206 is the gather-copy initiator to the other side 208 is expanded of the gathering server protocol 214 - a copy implementer 216. 메모리(212)는 또한 파일 저장부(file storage)(218)에 데이타 파일들을 저장한다. Memory 212 also stores data files in file storage (file storage) (218). 클라이언트 프로토콜(206)은 파일 저장부(218) 내의 파일들로의 일부 유형의 액세스를 제공하는 서버(104)에 특정 파일 시스템 제어 동작들을 다양한 클라이언트 어플리케이션들(204)이 호출하도록 한다. Client protocol 206 of the particular file system control operations on server 104 that provide some type of access to the files in the file storage unit 218, various client applications 204 to invoke. 파일들로의 액세스는, 예를 들어, 파일을 판독하고, 파일을 업데이트하고, 및 새 파일을 생성하는 것을 포함할 것이다. Access to the file is, for example, will include reading a file, updating a file, and create a new file. 서버 프로토콜(214)은 요구되는 작업들을 수행하여 클라이언트(102)로부터 파일 시스템 제어들에 응답한다. Server protocol 214 is to perform the work required responds to file system controls from client 102. 원격 프로토콜(206, 214)로의 집결-복사 프로토콜 확장(예를 들어, 집결-복사 시작자(208), 집결-복사 구현자(216))은 클라이언트 어플리케이션(204)이 클라이언트(102)로부터 서버(104)로 원격 파일 업데이트를 발효시키기 위해 사용할 수 있는 새 파일 시스템 제어(fsctl) 커맨드를 제공한다. Gathered to the remote protocol (206, 214) to copy protocol extension (e.g., a gather-copy implementer 216-copy initiator 208, gather) server from the client application 204. The client 102 ( 104) to a new file system that can be used to control the fermentation remote file update (fsctl) provides command. 일반적으로, 새 집결-복사 fsctl 커맨드는 어떻게 소스 데이타가 서버(104)의 소스 파일로부터 서버(104)의 수신지 파일로 복사되는지를 서버(104)에 지시한다. In general, the new gathering - fsctl Copy command is what indicates that the source data is copied from the source file on the server 104 as the destination of the file server 104 to the server 104. 일 구현에서, 집결-복사 fsctl 커맨드는 수신지 파일 핸들, 소스 파일 식별자(재개 키(resume key)), 및 파일 영역들의 어레이를 취하고, 오류 상태 및 소스 파일로부터 수신지 파일로 복사되는 데이타의 바이트들의 총 수를 리턴한다. In one implementation, the gather-copy fsctl command is the destination file handle, a source file identifier (resume key (resume key)), and takes an array of file regions, error status, and byte of data to be copied from the source file to a destination file the return of the total. 파일 영역들의 어레이에서 각 영역은 소스 파일 오프셋, 수신지 파일 오프셋, 및 복사/전송할 데이타의 바이트들의 길이 또는 수를 포함한다. Each region in an array of file regions includes a length or number of the source file offset, a destination file offset, and a copy / transfer of the data bytes. 그러므로, 각 영역은 소스 파일로부터 서버(104)의 수 신지 파일로 복사/전송되는 데이타의 청크(chunk) 또는 블럭을 정의한다. Thus, each region defines a chunk (chunk), or block of data to be copied / transferred to the destination file on the server 104 from the source file. 소스 파일 오프셋은 다수의 소스 데이타의 바이트들(예를 들어, 소스 파일로부터의 데이타 청크)이 복사될 소스 파일 내의 시작 위치를 식별한다. Source file offset identifies a beginning location within the plurality of bytes of source data (e.g., data chunk from the source file), the source file will be copied. 수신지 파일 오프셋은 다수의 소스 데이타의 바이트들이 복사될 수신지 파일 내의 시작 위치를 식별한다. The destination file may be offset number of bytes of source data are copied identifies the starting location within the destination file. 길이는 소스 파일로부터 수신지 파일로 복사되는 바이트들의 수를 정의한다. Length defines the number of bytes to be copied to the destination file from the source file. 1) 응용 프로그램은 적어도 READ_DATA 액세스로 소스 파일을 연다. 1) The application opens the source file with at least READ_DATA access. 2) 응용 프로그램은 기존 fsctl(FSCTL_SRV_REQUEST_RESUME_KEY)을 통해 서버로부터 소스 파일 식별자(재개 키)를 요구한다. 2) The application requests a source file identifier (resume key) from the server through an existing fsctl (FSCTL_SRV_REQUEST_RESUME_KEY). 3) 응용 프로그램은 적어도 WRITE_DATA 액세스로 수신지 파일을 생성한다/연다. 3) Application opens / creates a destination file with at least WRITE_DATA access. 4) 응용 프로그램은 소스 파일로부터 수신지 파일로 복사되는 데이타 블럭들의 영역 리스트를 구성한다. 4) application constitutes a region list of data blocks to be copied to the destination file from a source file. 5) 응용 프로그램은 집결-복사 fsctl 커맨드(FSCTL_SRV_COPYCHUNK)를 발행하고, 리턴되는 상태 및 복사되는 바이트들의 수를 검사한다. 5) The application gathers - check the number of copies fsctl command (status and copy number of bytes to be issued, and returns FSCTL_SRV_COPYCHUNK). 도 3 및 도 4는 원격 서버(104)의 소스 파일(300)과 수신지 파일(302)의 예, 및 클라이언트(102)의 소스 파일의 클라이언트 복사본(304)의 예를 도시한다. Figure 3 and 4 illustrate an example of a remote server 104, the source file 300 and the function example of the destination file 302, and a client 102, the client copy 304 of the source file of the. 소 스 파일(300), 수신지 파일(302), 및 소스 파일 복사본(304)의 예는 집결-복사 프로토콜 확장(208, 216)(집결-복사 fsctl 커맨드)을 사용하여 원격 파일을 업데이트하는 프로세스의 예의 설명에서 유용하다. Source file 300, destination file 302, and the example of the source file copy 304 gather-copy protocol extension (208, 216) The process of updating a remote file using the (gathering copy fsctl command) in useful in the description. 도 3 및 도 4의 도시들은 원격 파일 업데이트의 개념 예를 제공하려고 의도되며, 그런 원격 파일 업데이트가 발생할 수 있는 실제 메카니즘 또는 메카니즘들을, 임의의 방식으로, 제한하려고 의도되지 않는다. City of Figures 3 and 4, and are intended to provide a conceptual example of a remote file updates, the actual mechanism or mechanisms that could cause such a remote file updates, in any manner, it is not intended to be limiting. 도 3의 예에서, 클라이언트 어플리케이션(204)은 서버(104)에 오픈(open) 요구를 전송하여 서버(104)에 소스 파일(300)를 연다. In the example of Figure 3, the client application 204 opens a source file 300 on server 104 by sending an open (open) request to the server 104. 클라이언트 어플리케이션(204)은 소스 파일(300)로부터의 데이타를 판독하기 위해 필요한 액세스를 적어도 가지며, 클라이언트(102)로 소스 파일 복사본(304)을 전송한다. Client application 204 sends a source file copy 304 to at least have the required access, the client 102 in order to read the data from the source file (300). 클라이언트 어플리케이션(204)은 또한 서버(102)로부터 소스 파일 식별자(재개 키)를 요구하고, 서버(104)에 다른 오픈 요구를 전송하여 수신지 파일(302)을 생성한다/연다. The client application 204 may also require a source file identifier (resume key) from the server 102, and transmits the open request to the other server (104) to be and / opens a destination file created 302. The 클라이언트 어플리케이션(204)은 수신지 파일(302)에 데이타를 기록하기 위해 필요한 액세스를 적어도 가진다. The client application 204 may have at least the access needed to write data to the destination file 302. 서버(104)의 소스 파일(300)과 수신지 파일(302) 간의 화살표들은 집결-복사 fsctl 커맨드가 클라이언트(102)로부터 전송되고 서버(104)에서 실행되고 있음을 지시하려고 의도된다. Between the server 104, the source file 300 and destination file 302. The arrows of gathering - is intended to indicate that the copy fsctl command is sent from the client 102 is running on the server 104. 집결-복사 프로세스는 통상적으로 클라이언트(102)의 응용 프로그램(204)의 사용자가 서버(104)로부터 소스 파일(300)을 다운로드하고, 응용 프로그램(204)을 사용하여 클라이언트 복사본(304)으로서 소스 파일(300)를 편집하고, 그 다음, 편집된 복사본으로 서버(104)를 업데이트하는 파일 업데이트 프로세스의 일부이다. Gather-copy process is typically the user of application 204 of the client 102, and download the source file 300 from server 104, a source file as a client copy 304 using an application 204, edit 300, a part of the next, updating the server 104 with the edited copy of the file update process. 클라이언트(102)의 소스 파일 복사본(304)에 만들어진 변경들에 기초하여, 클라이언트(102)의 집결-복사 확장 시작자(208)는 서버(104)에 전송되는 집결-복사 fsctl 커맨드를 생성하여 집결-복사 프로세스를 시작한다. Gathering of the client (102) based on changes made to the source file copy 304 on client 102-copy extension initiator 208 is gathered to be transmitted to the server 104 - gathered by creating a copy fsctl command - start the copying process. 집결-복사 fsctl 커맨드는 사용자/응용 프로그램(204)이 클라이언트(102)의 소스 파일 복사본(304)에 만든 변경들과 일관된 방식으로 수신지 파일(302)에 소스 파일(300)의 섹션들을 서버(104)가 복사하도록 지시한다. Gather-copy fsctl command server the section of the user / application 204. The client 102, the source file copy changes in the source file 300 to the destination file 302 in a consistent manner, made on 304 of the ( indicates 104) is to be copied. 서버(104)의 집결-복사 확장 구현자(216)는 서버(104)에 집결-복사 fsctl 커맨드를 해석하고 구현한다. Gathering the server 104-copy extension implementer 216 is assembled in the server (104) interprets and implements the copy fsctl command. 소스 파일(300)과 수신지 파일(302) 간의 화살표들은, 예를 들어, 집결-복사 fsctl 커맨드가 다수의 소스 데이타의 바이트들이 복사될 소스 파일(300) 내의 시작 위치를 식별하는, 1의 소스 파일 오프셋을 제공함을 지시한다. Source file 300 and the number of arrows between the destination file 302 may include, for example, gather-copy pair of 1, identifying a beginning location within the fsctl command is a plurality of source data in bytes to the source file 300 to be copied It indicates the file provide an offset. 집결-복사 fsctl 커맨드는 또한 복사될 데이타의 바이트들의 수를 식별하는, 길이 10을 제공한다. Gather-copy fsctl command, there is provided a length 10, which also identifies the number of bytes of data to be copied. 함께, 소스 파일 오프셋과 길이는 소스 파일(300)로부터 수신지 파일(302)로 복사되는 데이타 청크를 정의한다. Together, the source file offset and the length define a chunk of data is copied to the destination file 302 from the source file (300). 이 예에서, 오프셋 1에서 시작하고 오프셋 10에서 종료하는 소스 데이타 블럭(306)은 소스 파일(300)로부터 수신지 파일(302)로 복사되는 데이타 블럭으로서 집결-복사 fsctl 커맨드에 의해 정의된다. In this example, starting at offset 1, and the source data block 306 which ends at offset 10 is gathered as the data block is copied to the destination file 302 from the source file (300) is defined by the copy fsctl command. 도시된 수신지 파일(302)은 집결-복사 fsctl 커맨드가 또한 10의 수신지 파일 오프셋를 제공하여, 식별되는 수의 바이트들이 복사될 수신지 파일(302) 내의 시작 위치를 식별함을 나타낸다. A destination file 302 is shown gather-copy fsctl command has also provided to a destination file 10 ohpeusetreul, the number of bytes to be identified may be copied indicates that identifies a beginning location within the destination file 302. 그러므로, 소스 데이타 블럭(306)은, 길이 파라미터 10에 따라, 오프셋 10에서 시작하여 오프셋 20에서 종료하는, 수신지 파일(302)에 복사된다. Thus, source data block 306, according to the length parameter 10, starting at offset 10 is copied to, the destination file 302 that ends at offset 20. 상술된 바와 같이, 집결-복사 fsctl 커맨드는 소스 파일(300) 로부터 수신지 파일(302)에 복사되는 파일 영역들(데이타 블럭들)의 어레이를 포함하거나 정의할 수 있다. Copy fsctl command may include or define an array of the destination file 302 in the file area are copied from the source file 300 (data blocks), gathered as described above. 그러므로, 상술된 것과 유사한 방식으로, 도 3에 대해 기재되는 집결-복사 fsctl 커맨드는 또한 소스 파일(300)로부터 수신지 파일(302)(수신지 파일 오프셋 30, 길이 20)에 소스 데이타 블럭(310)(소스 파일 오프셋 20, 길이 20)을 복사하도록 서버(104)(예를 들어, 집결-복사 확장 구현자(216))에 지시한다. Therefore, in a manner similar to that described above, the gathering is described for 3-copy fsctl command has also the destination file 302 (destination file offset 30, length 20) to the source data block from the source file 300 (310 ) (the server 104 to copy the source file offset 20, length 20) (e.g., gather-copy extension implementer 216 instructs). 집결-복사 fsctl 커맨드가 서버(104)에서 실행된 후에, 수신지 파일(302) 내의 2개의 섹션들은 빈채로 남아 있거나, 데이타가 없음이 수신지 파일(302)에서 명백하다. Gathering - After fsctl Copy command is executed on the server 104, the number two sections within the destination file 302 are apparent in the destination file 302 or remains empty, there is no data. 수신지 파일(302) 내의 비어 있는 섹션들(312, 314)은 클라이언트(102)의 소스 파일 복사본(304)에 만들어진 변경들에 따라 이들 섹션들(312, 314)에 기록되는 새 데이타를 기대하여 집결-복사 fsctl 커맨드에 의해 의도적으로 생성된다. You can expect the new data to be written to the empty section that within the destination file 302, 312, 314 are those sections in accordance with changes made to the source file copy 304 on the client 102, 312, 314 gathering - is deliberately created by the copy command fsctl. 클라이언트(102)의 소스 파일 복사본(304)은 사용자가 소스 파일 복사본(304) 내의 2개의 다른 위치들에서 추가한 2개의 새로운 블럭들(316, 318)을 도시한다. Source file copy 304 on the client 102 is shown to the user and the two new blocks (316, 318) added at two different locations within the source file copy 304. 제1의 새 데이타 블럭(316)은 소스 파일 복사본(304)의 새 오프셋 위치에 소스 데이타 블럭(306)을 효과적으로 재위치하는 한편, 제2의 새 데이타 블럭(318)은 소스 파일(300)로부터 원래 소스 데이타 블럭(308)을 교체함(예를 들어, 삭제되거나 겹쳐씀)을 주목한다. New data block 316 is a new data block 318 of the relocated the source data block 306 is effectively a new offset location of the source file copy 304, while the second of the first is from a source file (300) it is noted that the replacement of the original source data block 308 (e. g., deleted or overwritten writing). 따라서, 집결-복사 확장 시작자(208)는 집결-복사 fsctl 커맨드를 생성하여 서버(104)에게 수신지 파일(302) 내의 적절한 오프셋 위치에 소스 데이타 블럭(306)을 복사하도록 하고, 소스 데이타 블럭(308)을 전혀 복사하지 말도록 지시한다. Thus, gather-copy extension initiator 208 may gather-copy to generate fsctl command, and to copy the source data block 306 to an appropriate offset position within the server 104, the destination file 302, a source data block the 308 indicates that you do not copy at all. 그러므로, 소스 데이타 블럭(308)은 수신지 파일(302)에 복사되지 않아서 효과적으로 삭제된다. Thus, source data block 308 can be effectively removed because the file is not copied to the destination (302). 대신, 집결-복사 fsctl 커맨드는 새 데이타가 기록될 비어 있는 섹션(314)을 남긴다. Instead, gather-copy command leaves fsctl section 314 is empty when new data is written. 도 4는 수신지 파일(302)의 적절한 위치들에 기록되는 클라이언트(102)의 소스 파일 복사본(304)으로부터 새 데이타 블럭들(316, 318)을 도시한다. Figure 4 shows a number of new data blocks (316, 318) from the source file copy 304 on client 102 being written to the appropriate location in the destination file (302). 클라이언트(102)로부터 서버(104)로의 데이타 기록은 위에 논의된 집결-복사 fsctl 커맨드의 구현과 연결하여 발생한다. Data recording to the server 104 from the client 102, the gather discussed above - be generated in connection with the implementation of the copy fsctl command. 그러나, 클라이언트(102)로부터의 데이타 기록은 집결-복사 fsctl 커맨드가 서버(104)에 전송되는 시간 전 또는 후에 발생할 수 있음이 주목된다. However, data written from the client 102 is gathering - it is noted that the copy fsctl command may occur before or after the time that is sent to server 104. 즉, 수신지 파일(302)이 클라이언트(102)로부터의 적절한 요구에 기초하여 생성되자마자/열리자마자, 클라이언트(102)로부터의 집결-복사 fsctl 커맨드에 응답하여 서버(104)에 의해 수신지 파일(302)에 데이타가 복사될 수 있거나, 또는 클라이언트(102)로부터의 데이타 기록 요구(write request)로 수신지 파일(302)에 데이타가 쓰여질 수 있다. That is, destination file 302, gathered from this as soon as the open / as soon as it is generated on the basis of the appropriate request from the client 102, client 102-copy destination file by the server 104 in response to fsctl command 302, or data can be copied, or may be the data to be written to the destination file 302 to the data write request (write request) from the client 102 to the. 두 경우 모두에, 집결-복사 fsctl 커맨드는 서버(102)에게, 소스 파일(300)로부터의 어느 데이타 블럭들을 수신지 파일(302)에 복사하는지, 및 데이타 블럭들을 수신지 파일(302)의 어느 위치들에 복사하는지를 지시한다. In either case, the gather-one copy fsctl command server 102 to a source file to hear any data blocks from the 300 that copies the destination file 302, and the number of the data block destination file 302 indicates whether the copy to location. 클라이언트(102)로부터의 새 데이타가 서버(104)가 집결-복사 fsctl 커맨드를 실행하기 전 또는 후에 수신지 파일(302)에 쓰이는지는 중요하지 않다. New data from the client 102, the server 104 gathers - sseuyineunji to the destination file 302 before or after executing the copy fsctl command is not critical. 입력 버퍼에서, SourceFile은 적어도 READ_DATA 액세스로 열린 파일로부터 FSCTL_QUERY_RESUME_KEY를 사용하여 얻어진 재개 키(소스 파일 식별자)이다. In the input buffer, SourceFile is the resume key (source file identifier) ​​obtained using FSCTL_QUERY_RESUME_KEY from an open file with at least READ_DATA access. ChunkCount는 Chunk 어레이의 SRV_COPYCHUNK 구조들(소스 파일 영역들)의 수이다. 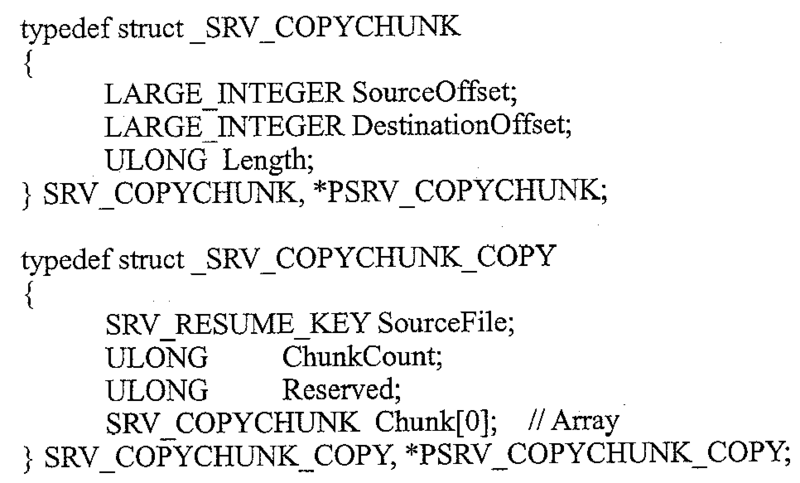 ChunkCount is the number of the SRV_COPYCHUNK structure of the Chunk array (source file regions). 각 SRV_COPYCHUNK 구조에서, SourceOffset은 복사해오기 위한 SourceFile의 위치로서 세트되고, DestinationOffset은 복사하기 위한 수신지 핸들의 오프셋으로서 세트된다. In each SRV_COPYCHUNK structure, SourceOffset is set as the position of the SourceFile to come to copy, DestinationOffset is set as an offset in the destination handle to copy. 길이는 소스 오프셋으로부터 수신지 오프셋에 전송하기 위해 바이트들의 수를 포함할 것이다. Length will comprise the number of bytes to send to a destination offset from the source offset. 집결-복사 fsctl은 서버가 소스 파일로부터 수신지 파일로 지정된 청크들(데이타 블럭들)의 전부를 복사하면 STATUS_SUCCESS를 리턴한다. Gather-copy fsctl is if the server copy all of the chunks specified by the destination file from the source file (data blocks) returns STATUS_SUCCESS. 이 경우, 출력 버퍼의 ChunksWritten은 입력 버퍼의 ChunkCount를 매치해야 한다. In this case, ChunksWritten of the output buffer should match the ChunkCount of the input buffer. 서버(104)가 청크(데이타 블럭들)를 복사하기를 실패하면, 그것은 청크가 복사될 수 없는 이유를 지시하는 상태 코드를 리턴할 것이다. When the server 104 fails to copy a chunk (the data block), it will return a status code that indicates the reason that can not be copied chunks. 이 경우, 출력 버퍼의 ChunkWritten은 성공적으로 복사된 청크들의 수를 지시할 것이다. In this case, ChunkWritten of the output buffer will indicate the number of successfully copied chunks. 서버(104)는 입력 버퍼의 Chunk 어레이에 의해 지정된 순서로 청크들을 프로세스하고, 그것은 제1 실패에 중지할 것임을 주목한다. Server 104. It is noted that the process of chunks in the order specified by the Chunk array in the input buffer, and it stops the first failure. ChunkMax = 하나의 집결-복사 fsctl 커맨드에 복사될 청크들의 최대 수. ChunkMax = one gathering - maximum number of chunk will be copied to the copy command fsctl. 디폴트의 예는 256이다. A default example 256. ChunkWriteLimit = 바이트로 지정된, 하나의 청크로 복사될 데이타의 최대양. ChunkWriteLimit = Maximum amount of data to be copied into a single chunk, specified in bytes. 디폴트의 예는 1MB이다. For the default is 1MB. ChunkTotalWriteLimit = 바이트들로 지정된, 하나의 집결-복사 fsctl 커맨드에 복사될 데이타의 최대 양. ChunkTotalWriteLimit =, one of the gatherings specified in bytes - Copy the maximum amount of data to be copied to fsctl command. 디폴트의 예는 16MB이다. For the default is 16MB. ChunkTimeout = 초로 지정된, 하나의 집결-복사 fsctl 커맨드를 프로세싱하는 동안 경과할 수 있는 시간의 최대 양. ChunkTimeout = seconds specified, one of the gathering - the maximum amount of elapsed time that can be copied fsctl while processing the command. 디 폴트의 예는 25 초이다. An example of the default is 25 seconds. 원격 프로토콜을 통한 원격 파일 업데이트를 구현하는 방법들의 예는 이제 도 5 내지 도 8의 흐름도들의 기본 참조로 기재될 것이다. Examples of how to implement remote file updates through a remote protocol will now be described with primary reference to the flow chart of Fig. 5 to Fig. 방법들은 일반적으로 도 1 내지 도 4에 대해 위에 논의된 실시예들에 적용한다. Methods are generally also applicable to the embodiments discussed above for Figures 1-4. 한 개 이상의 방법들이 흐름도들 및 흐름도들의 블럭들과 연관된 텍스트에 의해 개시되는 한편, 개시된 방법들의 소자들은 그들이 제공된 순서로 수행될 필요는 없으며, 다른 순서들도 유사한 이점들의 결과를 가져올 수 있음을 이해할 것이다. One or more methods have a flow chart and which is initiated by the text associated with the blocks of the flow chart the other hand, are the elements of the described method need not be performed in the order they are supplied, it appreciated that other order are also to get the result of similar advantages will be. 더욱이, 방법들은 배타적이 아니며, 혼자서 또는 서로 조합하여 수행될 수 있다. Furthermore, the methods are not exclusive and can be performed alone or in combination with one another. 기재된 방법들의 소자들은, 예를 들어, ASIC의 하드웨어 로직 블럭들에 의해, 또는 프로세서-판독가능 매체에 정의된 프로세서-판독가능 명령들의 실행에 의해 등을 포함하는 임의의 적합한 수단에 의해 수행될 수 있다. Elements of the described methods may include, for example, by hardware logic blocks of the ASIC, or a processor may be performed by any suitable means, or the like by the execution of read instructions-readable The processor defined in the medium have. 본 명세서에 사용되는 바와 같이, "프로세서-판독가능 매체"는 프로세서에 의해 사용 또는 실행을 위한 명령들을 포함하거나, 저장하거나, 통신하거나, 전파하거나, 또는 전송할 수 있는 임의의 수단일 수 있다. As used herein, - may be a "processor readable medium" may include instructions for use or execution by a processor, or storage, or communication, or radio waves, or any means that can be transferred. 프로세서-판독가능 매체는, 전자, 자기, 광, 전자기, 적외선, 또는 반도체 시스템, 장치, 디바이스, 또는 전파 매체일 수 있지만, 이에 제한되는 것은 아니다. A processor-readable medium, it is not electronic, it can be a magnetic, optical, electromagnetic, infrared, or semiconductor system, apparatus, device, or propagation medium, limited. 프로세서-판독가능 매체의 더 구체적 예들은, 다른 것들 중에도, 한 개 이상의 유선들을 갖는 전기 접속(전자), 휴대용 컴퓨터 디스켓(자기), RAM(random access memory)(자기), ROM(read only memory)(자기), EPROM(erasable programmable-read-only memory) 또는 플래쉬 메모리, 광섬유(광), 재기록 가능한 컴팩트 디스크(CD-RW)(광), 및 휴대용 CD-ROM(광)을 포함한다. Processor electrically connected with while more specific example of the readable medium include, among other things, the at least one wire (e), a portable computer diskette (magnetic), RAM (random access memory) (magnetic), ROM (read only memory) (magnetic), an (erasable programmable read-only-memory), EPROM or flash memory, an optical fiber (optical), a rewritable compact disc (CD-RW) (optical), and a portable CD-ROM (optical). 방법(500)의 블럭(502)에서, 원격 서버(104)의 소스 파일이 열린다. At block 502 of method 500, it will open the source file on the remote server (104). 소스 파일은 적어도 데이타 판독 상태로 열린다. The source file is opened with at least data read status. 소스 파일은 클라이언트(102)에서 실행하고, SMB(Server Message Block) 프로토콜, NFS(Network File System) 프로토콜, WebNFS 프로토콜, CIFS(Common Internet File System) 프로토콜, 삼바 등과 같은 원격 통신 프로토콜을 사용하는 클라이언트 어플리케이션(204)에 의해 열린다. The source file is a client application that is running on the client 102, using a remote communication protocol, such as (Server Message Block) SMB protocol, NFS (Network File System) protocol, WebNFS protocol, CIFS (Common Internet File System) protocol, Samba take place by 204. the 블럭(504)에서, 수신지 파일은 원격 서버(104)에서 열린다. At block 504, a destination file is opened on the remote server (104). 블럭(506)에서, 소스 파일의 복사본은 서버(104)로부터 클라이언트(102)로 검색되거나 또는 다운로드된다. At block 506, a copy of the source file is retrieved or downloaded from the server 104 to the client 102. 블럭(508)에서, 클라이언트(102)는 소스 파일을 식별하는 식별자(즉, 재개 키)를 요구한다. At block 508, the client 102 requests an identifier (i.e., a resume key) that identifies the source file. 블럭(510)에서, 집결-복사 파일 시스템 제어(fsctl) 커맨드는 서버(104)에 전송되어, 서버에게 소스 파일로부터 소스 데이타를 집결하도록 하고 소스 파일로부터 수신지 파일로 소스 데이타를 복사하도록 지시한다. Block at 510, a gather-copy file system control (fsctl) command is sent to the server 104, a server and a to gather source data from the source file, and instructs to copy the source data into the destination file from a source file . 원격 프로토콜의 집결-복사 확장(208)은 서버(104)로부터 검색된 소스 파일의 복사본에 만들어진 변경들 에 기초한 집결-복사(fsctl) 커맨드를 생성한다. Gathering of the remote protocol extended copy 208 is gathered based on the changes made to the copy of the source file retrieved from the server (104) to generate a copy (fsctl) command. 소스 파일의 복사본에 만들어진 변경들에 따라, 소스 파일로부터 수신지 파일로 소스 데이타가 복사되는 방법을 정의하는 파일 영역들의 어레이가 구성된다. In accordance with changes made to the copy of the source file and consists of an array of file regions that define how source data is copied to a destination file from a source file. 파일 영역들의 어레이, 소스 파일 식별자, 및 수신지 파일 핸들은 집결-복사 fsctl 커맨드에 전송된다. Array, the source file identifier, and a destination file handle of the file area is accounted - is transferred to the copy fsctl command. 어레이를 구축하는 것은, 어레이의 각 파일 영역에 대해, 서버(104)가 복사를 시작할 소스 파일의 시작 위치를 지시하는 소스 오프셋을 결정하는 것을 포함한다. It is to build an array, comprises, for each file region in the array, the server 104 determines a source offset that indicates the starting position of the source file to start copying. 수신지 오프셋은 서버(104)가 소스 파일 데이타를 복사하기를 시작할 수신지 파일의 시작 위치를 지시한다. The destination offset server 104 can start to copy the data source file to indicate the starting location of the destination file. 소스 파일로부터 수신지 파일로 복사되는 각 소스 파일 데이타 블럭의 길이를 결정하는 복사할 바이트들의 길이, 또는 수가 또한 포함된다. Length, or number of bytes to copy, which determines the length of each source file data block to be copied from the source file to a destination file is also included. 블럭(512)에서, 클라이언트(102)는 소스 파일로부터 수신지 파일로 복사되는 지정된 소스 데이타의 바이트들의 총 수를 지시하는 서버(104)로부터 상태 지시자를 수신한다. At block 512, the client 102 receives a status indicator from the server 104 indicating the total number of bytes of the specified source data that are copied to the destination file from a source file. 방법은 도 6의 블럭(514)에서 시작한다. The method begins at block 514 of FIG. 블럭(514)에서, 클라이언트(102)는 서버가 소스 파일로부터 수신지 파일로 지정된 소스 데이타의 전체를 복사하면 서버(104)로부터 성공 지시자를 수신한다. At block 514, the client 102 receives a success indicator from the server 104 if the server copies all of the specified source data to the destination file from a source file. 블럭(516)에서, 클라이언트(102)는 서버(104)가 소스 파일로부터 수신지 파일로 지정된 소스 데이타의 전체를 복사하기를 실패하면 상태 실패 지시자를 수신한다. At block 516, the client 102 if the server 104 fails to copy all of the data sources specified in the destination file from a source file, and receives the status failure indicator. 상태 실패 지시자와 함께, 클라이언트(102)는 모든 지정된 소스 데이타가 소스 파일로부터 수신지 파일로 복사되지 않는 이유를 지시하는 상태 코드를 수신한다. With status indicator fails, the client 102 receives a status code that indicates the reason for all the specified source data is not copied to the destination file from the source file. 블럭(518)에서, 클라이언트(102)는 서버(104)에 전송된 집결-복사 fsctl 커맨드가 임의의 서버 한계들을 초과하면 서버(104)로부터 무효 파라미터 지시자를 수신한다. At block 518, the client 102 may gather the transmission to the server (104) receives an invalid parameter indicator from the server 104 if the copy fsctl command exceeds any server limits of. 서버 한계들이 초과되면, 클라이언트(102)는 또한 서버 파라미터들을 위해 설정된 최대 한계들을 지시하는 설정된 최대 한계들을 서버(104)로부터 수신한다. If server limits are exceeded, the client 102 also receives the maximum limit set to indicate the maximum limits set for server parameters from the server 104. 수신된 설정된 최대 한계들은 하나의 집결-복사 fsctl에 복사될 수 있는 데이타 청크들의 수에 대한 설정된 최대 한계(예를 들어, 256), 하나의 데이타 청크에 복사될 수 있는 데이타의 양에 대한 설정된 최대 한계(예를 들어, 1MB), 하나의 집결-복사 fsctl에 복사될 수 있는 데이타의 양에 대한 설정된 최대 한계(예를 들어, 16MB), 및 하나의 집결-복사 fsctl 커맨드를 프로세싱하는 동안 경과할 수 있는 시간의 양에 대한 설정된 최대 한계(예를 들어, 25 초)를 포함한다. The received set maximum limits are single gather-copy and the maximum limit set for the number of data chunks that can be copied to fsctl (e.g., 256), the maximum is set for the amount of data that can be copied in a single data chunk threshold (e.g., 1MB), a gather-copy and the maximum limit set for the amount of data that can be copied to fsctl (e.g., 16MB), and a gathering-elapse while processing a copy fsctl command the maximum limit is set for the amount of time that can include (e.g., 25 seconds). 블럭(520)에서, 클라이언트(102)는 빈 공간으로 남겨진 수신지 파일의 위치들에 새 데이타(즉, 소스 파일 데이타에 반해서)를 기록한다. At block 520, the client 102 writes new data (i.e., as opposed to source file data) to the location of the destination file left blank. 클라이언트(102)는 데이타가 기록되는 장소를 지시하는 수신지 파일 내의 오프셋들과 함께, 기록되는 새 데이타를 포함하는 서버로 기록 요구를 전송한다. Client 102 sends a write request to the server containing the new data it is with the offset within the destination file indicating where the data is recorded, a recording. 새 데이타는 집결-복사 fsctl 커맨드가 서버에 의해 실행되기 전 또는 후에 수신지 파일에 기록될 수 있음이 주목된다. New data is gathered - it is noted that fsctl Copy command can be written to the destination file before or after execution by the server. 원격 프로토콜을 통한 원격 파일 업데이트를 구현하는 다른 방법(700)은 도 7에서 시작하는 것이 도시된다. Another method 700 of implementing remote file updates through a remote protocol is shown to begin in FIG. 방법(700)의 블럭(702)에서, 서버(104)는 클라이언트(102)로부터의 제1 오픈 요구에 응답하여 적어도 판독 데이타 상태로 소스 파일을 연다. At block 702 of method 700, a server 104 in response to a first open request from the client 102 opens a source file with at least read data status. 블럭(704)에서, 서버(104)는 클라이언트(102)로부터의 제2 오픈 요구에 응답하여 적어도 기록 데이타 상태로 수신지 파일을 연다. At block 704, the server 104 in response to a second open request from the client 102 opens a destination file with at least a data recording state. 블럭(706)에서, 서버(104)는 클라이언트(102)로부터 수신된 집결-복사 fsctl 커맨드에 응답하여 소스 파일로부터 수신지 파일로 소스 데이타를 복사한다. At block 706, the server 104 gathers the received from the client (102) in response to the copy fsctl command to copy the source data to the destination file number from the source file. 집결-복사 fsctl 커맨드는 소스 데이타가 소스 파일로부터 수신지 파일로 복사되는 방법을 정의하는 파일 영역들의 어레이를 포함한다. Gather-copy fsctl command and comprises an array of file regions that defines how the source data to be copied to the destination file from a source file. 파일 영역들의 어레이는 클라이언트(102)에 위치된 소스 파일의 복사본에 만들어진 변경들에 따라 클라이언트(102)에 구성된다. The array of file regions is configured in the client 102 according to changes made to the copy of the source file located on the client (102). 어레이의 각 파일 영역은 서버(104)가 복사를 시작할 소스 파일의 시작 위치를 지시하는 소스 오프셋, 서버(104)가 소스 파일 데이타를 복사하기를 시작할 수신지 파일의 시작 위치를 지시하는 수신지 오프셋, 및 소스 파일로부터 수신지 파일로 복사될 각 소스 파일 데이타 블럭의 길이를 결정하는 복사할 바이트들의 길이 또는 수를 포함한다. Each file region in the array is that the server 104 is a source offset that indicates the starting position of the source file to start copying, the server 104 gives an instruction to the start of the destination file to start copying the source file data destination offset , and a number of long or the number of bytes to copy, which determines the length of each source file data block to be copied to the destination file from a source file. 집결-복사 fsctl 커맨드는 또한 소스 파일 식별자와 수신지 파일 핸들을 포함한다. Gather-copy fsctl command and also includes a source file identifier and a destination file handle. 블럭(708)에서, 소스 파일로부터 수신지 파일로 복사되는 지정된 소스 데이타의 바이트들의 총 수를 지시하는 상태 지시자를 클라이언트(102)로 전송한다. At block 708, it transmits a status indicator indicating the total number of bytes of the specified source data to be copied to the destination file number from the source file to the client (102). 블럭(710)에서, 서버가 소스 파일로부터 수신지 파일로 지정된 소스 데이타의 전체를 복사하면 성공 지시자를 서버(104)가 클라이언트(102)로 전송한다. At block 710, if the server copies all of the specified source data to the destination file from a source file and sends a success indicator, the server 104 to the client 102. 블럭(712)에서, 소스 파일로부터 수신지 파일로 지정된 소스 데이타 전부를 서버(104)가 복사하기를 실패하면 상태 실패 지시자를 서버(104)가 전송한다. A block (712), the number if all source data specified by the destination file server 104 fails to copy server 104, the status failure indicator from the source file is transmitted. 상태 실패 지시자와 함께, 서버(104)는 소스 파일로부터 수신지 파일로 모든 지정된 소스 데이타가 복사되는 이유를 지시하는 상태 코드를 전송한다. With status indicator fails, the server 104 sends a status code that indicates the reason that copies all specified data source to the destination file from the source file. 방법(700)은 도 8의 블럭(714)에서 계속된다. The method 700 continues at block 714 of FIG. 블럭(714)에서, 서버(104)는 집결-복사 fsctl 커맨드가 임의의 서버 한계들을 초과하면 클라이언트(102)로의 무 효 파라미터 지시자를 전송한다. At block 714, the server 104 may gather-copy fsctl command has been exceeded when any of the server transmits the non-marginal effect parameter indicator to the client 102. 서버 한계들이 초과되면, 서버(104)는 서버 파라미터들을 위해 설정된 최대 한계들을 지시하는 서버(104)로부터 설정된 최대 한계들을 전송한다. If server limits are exceeded, the server 104 sends the maximum limit set by the server 104 which indicate the maximum limits set for server parameters. 전송된 설정된 최대 한계들은 하나의 집결-복사 fsctl에 복사될 수 있는 데이타 청크들의 수에 대한 설정된 최대 한계(예를 들어, 256), 하나의 데이타 청크에 복사될 수 있는 데이타의 양에 대한 설정된 최대 한계(예를 들어, 1MB), 하나의 집결-복사 fsctl에 복사될 수 있는 데이타의 양에 대한 설정된 최대 한계(예를 들어, 16MB), 및 하나의 집결-복사 fsctl 커맨드를 프로세싱하는 동안 경과할 수 있는 시간의 양에 대한 설정된 최대 한계(예를 들어, 25 초)를 포함한다. The set transmission upper limit have a gather-copy and the maximum limit set for the number of data chunks that can be copied to fsctl (e.g., 256), the maximum is set for the amount of data that can be copied in a single data chunk threshold (e.g., 1MB), a gather-copy and the maximum limit set for the amount of data that can be copied to fsctl (e.g., 16MB), and a gathering-elapse while processing a copy fsctl command the maximum limit is set for the amount of time that can include (e.g., 25 seconds). 블럭(716)에서, 서버(104)는 빈 공간으로 남겨지는 수신지 파일의 위치들에 수신지 파일에 기록되는 새 데이타(즉, 소스 파일 데이타에 반해서)를 포함하는 클라이언트(102)로부터의 데이타 기록 요구를 수신한다. Data from at block 716, the server 104 to the client 102 including the empty spaces can be left to the new data to be written to the destination file on the location of the destination file (i.e., as opposed to source file data) It receives a write request. 블럭(718)에서, 서버(102)는 기록 요구에 따라 수신지 파일이 비어 있는 위치들에 새 데이타를 기록한다. At block 718, the server 102 writes the new data to the empty position in the destination file according to the write request. 새 데이타는 집결-복사 fsctl 커맨드가 서버에 의해 실행되기 전 또는 후에 수신지 파일에 기록될 수 있음이 주목된다. New data is gathered - it is noted that fsctl Copy command can be written to the destination file before or after execution by the server. 도 9는 도 1 내지 도 8의 참조에서 본 명세서의 위에 논의된 바와 같이 클라이언트 디바이스(102)와 서버 디바이스(104)와 같은 컴퓨터 디바이스들을 구현하기에 적절한 컴퓨팅 환경의 예를 도시한다. Figure 9 illustrates an example of a suitable computing environment for implementing the computer device, such as client device 102 and server device 104 as discussed above in the specification in reference to FIG 1 to FIG. 하나의 특정 구성이 도 9에 도시되었지만, 그런 컴퓨팅 디바이스들은 다른 컴퓨팅 구성들에서도 구현될 수 있을 것이다. Although one specific configuration is shown in Figure 9, are such a computing device may be implemented in other computing configurations. 컴퓨팅 환경(900)은 컴퓨터(902)의 형태로 일반 목적 컴퓨팅 시스템을 포함한다. The computing environment 900 includes a general purpose computing system in the form of a computer 902. 컴퓨터(902)의 컴포넌트들은 한 개 이상의 프로세서들이나 프로세싱 유닛들(904), 시스템 메모리(906), 및 시스템 메모리(906)에 프로세서(904)를 포함하는 다양한 시스템 컴포넌트들을 결합하는 시스템 버스(908)를 포함할 수 있지만, 이에 제한되는 것은 아니다. Components of the computer 902 are the one or more processors or processing units 904, a system memory 906, and system bus 908 for coupling various system components including processor 904 to system memory 906 It can include, but is not limited thereto. 시스템 버스(908)는 메모리 버스나 메모리 제어기, 주변 기기 버스, 가속화된 그래픽 포트, 및 다양한 버스 구조들 중의 임의의 것을 사용하는 프로세서나 로컬 버스를 포함하는 여러 유형들의 버스 구조들 중의 임의의 한 개 이상의 것들을 나타낸다. The system bus 908 may be any one of the of the bus structures of different types and a processor or local bus using any of a memory bus or memory controller, a peripheral bus, an accelerated graphics port, and a variety of bus architectures gae It represents more than ones. 시스템 버스(908)의 일 예는, 또한 메자닌 버스라고도 알려진, PCI(Peripheral Component Interconnects) 버스일 것이다. One example of a system bus 908, will also be known as a Mezzanine bus known, PCI (Peripheral Component Interconnects) bus. 컴퓨터(902)는 다양한 컴퓨터-판독가능 매체들을 포함한다. It includes a readable medium the computer 902 is various computer. 그런 매체는 컴퓨터(902)에 의해 액세스가능한 임의의 이용가능한 매체일 수 있고, 휘발성 및 비휘발성 매체, 분리형 및 비분리형 매체를 포함한다. Such media can be any available media that is accessible by computer 902 and includes both volatile and nonvolatile media, removable and non-removable media. 시스템 메모리(906)는, RAM(random access memory;910)과 같은 휘발성 메모리, 및/또는 ROM(read only memory;912)과 같은 비휘발성 메모리의 형태로 컴퓨터 판독가능 매체를 포함한다. Includes; (912 read only memory), a nonvolatile memory in the form of a computer readable medium, such as; the system memory 906, RAM (random access memory 910), volatile memory and / or ROM, such as. 스타트업 동안 같은 때, 컴퓨터(902) 내의 소자들 간의 정보 전송을 돕는 기본 루틴들을 포함하는 BIOS(basic input/output system;914)는 ROM(912)에 저장된다. When the same during start-up, BIOS containing the basic routines that help to transfer information between elements within the computer (902) (basic input / output system; 914) is stored in the ROM (912). RAM(910)은 즉시 액세스가능하고 및/또는 현재 프로세싱 유닛(904)에 의해 동작되는 데이타 및/또는 프로그램 모듈들을 포함한다. RAM (910) comprises the data and / or program modules that are immediately accessible and operated by and / or the current processing unit (904). 컴퓨터(902)는 또한 다른 분리형/비분리형, 휘발성/비휘발성 컴퓨터 저장 매 체를 포함할 수 있다. Computer 902 may also include other removable / non-removable, volatile / nonvolatile computer storage media. 예로써, 도 9는 비분리형 비휘발성 자기 매체(도시 안됨)에 읽고 쓰는 하드 디스크 드라이브(916), 분리형, 비휘발성 자기 디스크(920)(예를 들어, "플로피 디스크")에 읽고 쓰는 자기 디스크 드라이브(918), 및 CD-ROM, DVD-ROM, 또는 기타 광 매체와 같은 분리형, 비휘발성 광 디스크(924)에 읽고 쓰기 위한 광 디스크 드라이브(922)를 도시한다. By way of example, Figure 9 is a non-removable, nonvolatile magnetic media, a hard disk drive 916, a removable, nonvolatile magnetic disk 920 to read and write the (not shown) (e.g., a "floppy disk") to read and write to the magnetic disk read into the drive 918, and CD-ROM, DVD-ROM, or other optical media, such as removable, nonvolatile optical disk 924, and an optical disk drive 922 for writing. 하드 디스크 드라이브(916), 자기 디스크 드라이브(918), 및 광 디스크 드라이브(922)는 한 개 이상의 데이타 매체 인터페이스들(925)에 의해 시스템 버스(908)에 각각 접속된다. Hard disk drive 916, magnetic disk drive 918, and optical disk drive 922 are each connected to the system bus 908 by one of the one or more data media interfaces (925). 다른 경우, 하드 디스크 드라이브(916), 자기 디스크 드라이브(918), 및 광 디스크 드라이브(922)는 SCSI 인터페이스(도시 안됨)에 의해 시스템 버스(908)에 접속될 수 있다. In other cases, hard disk drive 916, magnetic disk drive 918, and optical disk drive 922 can be connected to the system bus 908 by a SCSI interface (not shown). 디스크 드라이브들과 그들의 연관된 컴퓨터-판독가능 매체들은 컴퓨터-판독가능 명령, 데이타 구조, 프로그램 모듈, 및 컴퓨터(902)에 대한 기타 데이타의 비휘발성 저장을 제공한다. The disk drives and their associated computer-readable media have computer-provides a non-volatile storage of the other data to the readable instructions, data structures, program modules, and the computer 902. 예가 하드 디스크(916), 분리형 자기 디스크(920), 및 분리형 광 디스크(924)를 도시하지만, 자기 카세트나 다른 자기 저장 디바이스, 플래쉬 메모리 카드, CD-ROM, DVD나 다른 광 저장 장치, RAM, ROM, EEPROM(electrically erasable programmable read-only memory) 등과 같은 컴퓨터에 의해 액세스가능한 데이타를 저장할 수 있는 다른 유형들의 컴퓨터 판독가능 매체들은 또한 컴퓨팅 시스템과 환경의 예를 구현하기 위해 사용될 수 있다. Shows an example of the hard disk 916, removable magnetic disk 920, and removable optical disk 924, however, magnetic cassettes or other magnetic storage devices, flash memory cards, CD-ROM, DVD or other optical storage, RAM, ROM, EEPROM (electrically erasable programmable read-only memory) other types of computer readable media that can store data accessible by a computer, such as may also be used to implement the example computing system and environment. 예를 들어, 운영 체제(926), 한 개 이상의 응용 프로그램들(928), 다른 프로그램 모듈들(930), 및 프로그램 데이타(932)를 포함하는 임의의 수의 프로그램 모듈들은 하드 디스크(916), 자기 디스크(920), 광 디스크(924), ROM(912), 및/또는 RAM(910)에 저장될 수 있다. For example, operating system 926, one or more application programs 928, other program modules 930, and program data 932. Any number of program modules including a are a hard disk 916, It may be stored in a magnetic disk 920, an optical disk (924), ROM (912), and / or a RAM (910). 그런 운영 체제(926), 한 개 이상의 응용 프로그램들(928), 다른 프로그램 모듈들(930), 및 프로그램 데이타(932)(또는 그들의 일부 조합)의 각각은 사용자 네트워크 액세스 정보를 위한 캐싱 스킴의 일실시예를 포함할 수 있다. Each of such operating system 926, in one or more application programs 928, other program modules 930, and program data 932 (or some of them in combination) is one of the caching scheme for user network access information embodiments may include, for example. 컴퓨터(902)는 통신 매체로서 식별되는 다양한 컴퓨터/프로세서 판독가능 매체를 포함할 수 있다. Computer 902 may include a variety of computer / processor readable media identified as communication media. 통신 매체는 컴퓨터 판독가능 명령, 데이타 구조, 프로그램 모듈, 또는 반송파나 다른 전송 메카니즘과 같은 변조 데이타 신호의 다른 데이타를 구현하고, 임의의 정보 전달 매체를 포함한다. Communication media may implement different data of the modulated data signal such as computer readable instructions, data structures, program modules, or a carrier wave or other transport mechanism and includes any information delivery media. "변조 데이타 신호"라는 용어는 신호의 정보를 인코딩하는 방식으로 한 개 이상의 그것의 특성들이 설정되거나 변경되는 신호를 의미한다. The term "modulated data signal" means a signal that is to set or change one or more of its properties in such a manner as to encode information in the signal. 예로써, 통신 매체는 유선 네트워크나 직접 유선 접속과 같은 유선 매체, 및 음향, RF, 적외선, 및 기타 무선 매체들과 같은 무선 매체를 포함하지만, 이에 제한되는 것은 아니다. By way of example, and not limitation, communication media are not intended to includes wired media such as a wired network or direct-wired connection and a wired medium, and acoustic, RF, infrared, and other wireless media, such as, but limited. 상술된 것의 임의의 것의 조합들은 또한 컴퓨터-판독가능 매체의 범위 내에 포함된다. Of any of combinations of the above it is also computer-are included within the scope of readable media. 사용자는 키보드(934) 및 포인팅 디바이스(936)(예를 들어, "마우스")와 같은 입력 디바이스들을 통해 컴퓨터 시스템(902)에 커맨드와 정보를 입력할 수 있다. A user may enter commands and information into the computer system 902 through input devices such as a keyboard 934 and pointing device 936 (e.g., a "mouse"). 다른 입력 디바이스들(938)(특정하게 도시되지는 않음)은 마이크로폰, 조이스틱, 게임패드, 위성 접시, 직렬 포트, 스캐너 등을 포함할 수 있다. Other input devices 938 (not are not specifically shown) may include a microphone, joystick, game pad, satellite dish, serial port, scanner, or the like. 이들과 다른 입력 디바이스들은 시스템 버스(908)에 결합된 입력/출력 인터페이스(940)를 통해 프로세싱 유닛(904)에 접속되지만, 병렬 포트, 게임 포트, 또는 USB(universal serial port)와 같은 다른 인터페이스와 버스 구조들에 의해 접속될 수도 있다. These and other input devices are connected to the processing unit 904 through an input / output interface 940 is coupled to the system bus 908, and other interfaces such as a parallel port, game port, or a USB (universal serial port) but it may be connected by a bus structure. 모니터(942) 또는 다른 유형의 디스플레이 디바이스는 또한, 비디오 어댑터(944)와 같은, 인터페이스를 통해 시스템 버스(908)에 접속될 수 있다. Monitor 942 or other type of display device is also, via an interface, such as a video adapter 944 may be connected to the system bus 908. 모니터(942)에 추가하여, 다른 출력 주변 디바이스들은 입력/출력 인터페이스들(940)을 통해 컴퓨터(902)에 접속될 수 있는 스피커들(도시 안됨)과 프린터(946)와 같은 컴포넌트들을 포함할 수 있다. In addition to the monitor 942, other output peripheral devices can include components such as speakers (not shown) and printer 946 which can be connected to computer 902 via the input / output interface 940, have. 컴퓨터(902)는, 원격 컴퓨팅 디바이스(948)와 같은, 한 개 이상의 원격 디바이스들에 논리 접속들을 사용하여 네트워크 환경에서 동작할 수 있다. Computer 902, using a logical connection, the one or more remote devices, such as a remote computing device 948 may operate in a networked environment. 예로써, 원격 컴퓨팅 디바이스(948)는 퍼스널 컴퓨터, 휴대용 컴퓨터, 서버, 라우터, 네트워크 컴퓨터, 피어 디바이스나 다른 일반 네트워크 노드 등일 수 있다. By way of example, remote computing device 948 may be a personal computer, a portable computer, a server, a router, a network computer, a peer device or other common network node. 원격 컴퓨팅 디바이스(948)는 컴퓨터 시스템(902)에 관련하여 본 명세서에 기재된 소자들과 특징들의 다수 또는 전부를 포함할 수 있는 휴대용 컴퓨터로서 도시된다. Remote computing device 948 is illustrated as a portable computer that can include many or all of the elements and features described herein relative to the computer system 902. 컴퓨터(902)와 원격 컴퓨터(948) 간의 논리 접속들은 LAN(local area network;950)과 일반 WAN(wide area network;952)으로서 나타내진다. Logical connections between computer 902 and remote computer 948 are represented as a LAN;; (952 wide area network) (local area network 950) and the general WAN. 그런 네트워크 환경들은 사무실, 기업-전반 컴퓨터망, 인트라넷, 및 인터넷에서 일반적이다. Such networking environments are offices, enterprise-wide common in computer networks, intranets and the Internet. LAN 네트워크 환경에서 구현되었을 때, 컴퓨터(902)는 네트워크 인터페이스 또는 어댑터(954)를 통해 로컬 네트워크(950)에 접속된다. When implemented in a LAN networking environment, the computer 902 is connected to the local network 950 through a network interface or adapter 954. WAN 네트워크 환경에서 구현될 때, 컴퓨터(902)는 광역 네트워크(952)에 대해 통신을 개설하는 모뎀(956) 또는 다른 수단을 포함한다. When implemented in a WAN networking environment, the computer 902 includes a modem 956 or other means for opening the communication to the wide area network 952. 컴퓨터(902)에 내장이나 외장일 수 있는, 모뎀(956)은 입력/출력 인터페이스(940) 또는 다른 적절한 메카니즘들을 통해 시스템 버스(908)에 접속될 수 있다. Which may be internal or external to computer 902, modem 956 may be connected to the system bus 908 via input / output interfaces 940 or other appropriate mechanism. 도시된 네트워크 접속들은 예들일 뿐이고, 컴퓨터들(902, 948) 간의 통신 링크(들)을 개설하는 다른 수단이 채택될 수 있음을 이해할 것이다. The network connections shown are merely examples acceptable, it will be appreciated that other means for opening a communication link (s) between the computers (902, 948) can be employed. 컴퓨팅 환경(900)과 도시된 것과 같은, 네트워크 환경에서, 컴퓨터(902), 또는 그것의 일부, 에 관련되어 나타내진 프로그램 모듈들은 원격 메모리 저장 디바이스에 저장될 수 있다. In a network environment such as computing environment 900 as shown, it is related to the computer 902, or portions thereof, expressed binary program modules may be stored in the remote memory storage device. 예로써, 원격 응용 프로그램들(958)은 원격 컴퓨터(948)의 메모리 디바이스에 존재한다. By way of example, remote application programs 958 exists in a memory device of remote computer 948. 설명 목적으로, 운영 체제과 같은, 응용 프로그램들과 다른 실행가능 프로그램 컴포넌트들은, 그런 프로그램들과 컴포넌트들이 컴퓨터 시스템(902)의 다른 저장 컴포넌트들에 다양한 시간들에 존재하고 컴퓨터의 데이타 프로세서(들)에 의해 실행됨이 인식되지만, 본 명세서에서 이산 블럭들로서 설명된다. For illustrative purposes, the, applications and other executable program components, such programs and components are present in a variety of time in different storage components of the computer system 902 and a computer data processor (s), such as operating chejegwa Enabled is recognized by, but are described herein as discrete blocks. 본 발명은 구조적 특징들 및/또는 방법적 동작들의 언어에 특정하게 기재되지만, 첨부된 청구범위에서 정의된 본 발명은 기재된 특정 특징들이나 동작들에 제한될 필요는 없음을 이해할 것이다. The invention will be understood by structural features and / or methods, but particularly described in the language of enemy action, are not the invention defined in the appended claims is to be limited to the specific features or operations described. 대신에, 특정 특징들과 동작들은 청구된 발명을 구현하는 형태들의 예로서 개시된다. Instead, the specific features and operations are disclosed as examples of forms of implementing the claimed invention. 개시된 방법 및 시스템은 개선된 원격 프로토콜을 통해 원격 파일들의 효율적이고 신뢰성있는 업데이트를 가능하게 한다. The disclosed method and system enable efficient and reliable update of remote files through an improved remote protocol. 원격 프로토콜의 집결-복사 확장은 클라이언트가 서버에게 서버에 존재하는 소스 파일로부터 데이타 일부들을 집결하고, 서버의 새 수신지 파일 내의 적절한 오프셋들에 이들 데이타의 부분들을 복사하도록 지시할 수 있게 한다. The remote protocol gather-copy extension allows a client to instruct the data gathered, some from the source file on the server, and the server, the new server to the appropriate number of offset in the destination file to copy portions of these data. 그러므로, 집결-복사 확장은 파일 업데이트 동안 클 라이언트가 새 데이타를 기록할 수 있는 수신지 파일에 비어 있는 위치들을 클라이언트가 남기도록 한다. So, gather-copy extension to the client to leave the location of the client files for updating via the destination file that you can record the new data. 집결-복사 확장은 또한 소스 파일의 부분들을 소스 파일로부터 수신지 파일로 그들을 복사하지 않고 클라이언트가 효과적으로 삭제하도록 할 수 있다. Gather-copy extension can also be a client without copying them to the parts of the source file to the destination file from the source file to be deleted effectively. 그러므로, 파일 업데이트는 클라이언트로부터 서버로 전체 파일을 전송할 필요가 없이 만들어질 수가 있다. Therefore, the file update can be made without the need to transfer the entire file from the client to the server. 상기 원격 서버로부터 상기 소스 파일의 복사본을 검색하는 단계를 더 포함하는 컴퓨터 구현 방법. The computer-implemented method further comprises the step of retrieving a copy of the source file from the remote server. 상기 원격 서버로부터 상기 소스 파일의 식별자를 요청하는 단계를 더 포함하는 컴퓨터 구현 방법. The computer-implemented method further comprising requesting an identifier of the source file from the remote server. 상기 수신지 파일에 새 데이타를 기록하는 단계를 더 포함하는 컴퓨터 구현 방법. The computer-implemented method further comprises the step of writing the new data to the destination file. 상기 기록하는 단계는, 상기 원격 서버가 상기 소스 파일로부터 상기 수신지 파일로 소스 데이타를 복사할 때 생성되는 상기 수신지 파일 내의 비어 있는 위치(blank location)들에 기록될 데이타를 포함하는 데이타 기록 명령을 상기 원격 서버에게 전송하는 단계를 포함하는 컴퓨터 구현 방법. The method comprising the record, the data record containing the data that the remote server to be written to the location (blank location) blank in the destination file created when copying the source data into the destination file from the source file command the computer-implemented method comprising: transmitting to the remote server. 상기 집결-복사 fsctl 커맨드는 상기 소스 데이타의 바이트들이 상기 소스 파일로부터 복사되고 상기 수신지 파일에 저장되는 방법을 정의하는 파일 영역들의 어레이를 포함하고, 상기 어레이 내의 각각의 파일 영역에 대하여, 소스 오프셋, 수신지 오프셋 및 길이가 식별되고, 상기 소스 오프셋은 소스 데이타가 복사될 소스 파일 내의 시작 위치를 식별하고, 상기 수신지 오프셋은 상기 소스 데이타가 복사될 수신지 파일 내의 시작 위치를 식별하고, 상기 길이는 상기 소스 데이타의 바이트들의 수를 정의하는 컴퓨터 구현 방법. The gather-copy fsctl command, the source offset for each file region in the, and wherein the array comprises an array of file regions that defines how the bytes of said source data have been copied from the source file is stored in the destination file , a destination offset, and a length is identified, the source offset identifies a beginning location within the source file to be copied, the source data and the destination offset identifying a beginning location within the destination file to the source data is copied, the length is a computer-implemented method of defining the number of bytes of the source data. 를 더 포함하는 컴퓨터 구현 방법. The computer-implemented method further includes. 상기 클라이언트에게 소스 파일 식별자를 전송하는 단계를 더 포함하는 컴퓨터 구현 방법. The computer implemented method further comprising sending a source file identifier to the client. 제1항의 컴퓨터 구현 방법을 수행하도록 구성된 프로세서 실행가능 명령어들을 포함하는 컴퓨터 판독가능 저장 매체. The computer-readable storage medium including processor-executable instructions configured to perform the computer-implemented method of claim 1. 클라이언트 컴퓨터. The client computer. 을 더 포함하는 클라이언트 컴퓨터. The client computer further comprising. 을 더 포함하는 서버 컴퓨터. The server computer further comprising.